Jim D'Addario, chairman and CEO of musical accessory and instrument string innovator D'Addario & Co., Inc., looked up and down the east coast but chose to stay put, expand and upgrade on Long Island. find new high-tech homes in Babylon and Brooklyn. "They had a certain body and character that just wasn't there with other strings," says one of an album's worth of entertaining Web testimonials by the likes of dobro wizard Jerry Douglas, bluegrass icon Ricky Skaggs, rockers Liz Phair and Lenny Kravitz and others. The same qualities could be ascribed to the company that makes them, whose namesake family has been working in the cordaro tradition since the 17th century, when Donato D'Addario pursued his craft in the Italian village of Salle, in the province of Pescara, using sheep and hog gut. An earthquake drove his descendants to look for America, landing in Astoria, Queens in the early 1900s, where they continued honing their craft. Family members worked in the industry in various company permutations, including the introduction of nylon in the late 1940s after trying out a test batch from DuPont. In 1974, John D'Addario, Sr., and his sons John, Jr., and Jim founded D'Addario and Co., now the world's largest manufacturer of musical instrument strings, and also a leading manufacturer of accessories for fretted, bowed, percussion, and woodwind instruments. The company's mission statement says it aims to be "the first choice" in the industry. Today, D'Addario has made Long Island its first choice for facility expansion, after considering sites up and down the U.S. east coast. Jim D'Addario, chairman and CEO, says in an interview from the company's Farmingdale headquarters that the need to make a move came about in part because a previous planning team had low-balled company growth, which has seen revenues jump from $72 million in 2003 to $110 million in 2006. "We moved into a distribution center across the street from our main facility in 2002, and the consultants we used grossly underestimated the space requirements and selected the wrong automation equipment," he says. "We've been struggling with our distribution effort for six years." The company's four-building complex includes its string manufacturing plant, main office building, a facility across the street that manufactures drumheads and contains an in-house print shop, and the distribution center, where the company ran out of space. "We had to have finished goods stored in three buildings, with constant movement of material, which anyone in manufacturing will tell you is non-value-added," says D'Addario. So his team started looking at alternatives in 2004, including putting it all under one roof, which would require a building in the 200,000-sq.-ft. (18,580-sq.-m.) range. Those were in short supply at that time on Long Island, owing to a real estate boom and a conversion of a lot of space to office use in the aftermath of 9/11. "We didn't have many choices in Long Island, so we started looking out of state," says D'Addario, whose firm then spent a lot of time browsing in Pennsylvania, South Carolina and North Carolina. Key to the process was Syracuse-based Scottech, hired to do the location analysis. "They did a complete analysis of our whole distribution network including New York and California," he says. D'Addario & Co.'s intellectual capital includes self-designed and constructed machines: "That kind of intellectual capital has been the key to our success," says Jim D'Addario, who is not only an engineer himself, but can pluck a string or two. "We looked at whether to have just one in the Midwest, and analyzed things like our dealer-direct program, which involves a lot of orders each day in small quantity. And we have a big distributor business, so we had to look from many angles." The company's property portfolio beyond Long Island encompasses a manufacturing and distribution facility and artist relations facility in Sun Valley, Calif., and a west coast distribution facility in Chino, Calif.; satellite offices in Australia, Japan, Hong Kong and France; and plantations supporting its Rico Reed products in France and Argentina. Excepting the office locations, it's a total facility square footage of just 354,193 sq. ft. (32,905 sq. m.) – but it's a footprint packed with firepower. 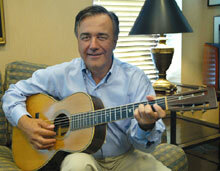 Savings from moving distribution only were not that significant, says D'Addario, coming in at under $100,000 a year. However, savings that would be derived from moving manufacturing to a lower-cost area would be "very significant." "We went down a lot of dead ends on Long Island," he says of the many buildings in need of refurbishment that the firm considered. "We were very close to having a deal on a 175,000-sq.-ft. (16,258-sq.-m.) building in Melville, and were going to relocate everything to that, but that fell through at the beginning of the year and we had to start from scratch again," he says. "Values on Long Island have gone insane. It's very difficult to justify $100 a square foot or more for factory space. You can lease more economically." Meanwhile, multiple properties in Pennsylvania and North Carolina would have "fit the bill beautifully, with dramatic savings from the manufacturing side." The first choice outside of New York was in Irwin, N.C., in Harnett County. "Their economic development commission put together an incredible offer for us on a 305,000-sq.-ft. (28,335-sq.-m.) facility, formerly the largest denim manufacturing facility in the country," says D'Addario. "They were willing to give us that building for less than one-tenth of what a comparable building on Long Island would cost. It was beautiful, tilt-up, involving an investment of under $2 million. And they wanted to get our 700 to 800 jobs. "It was a difficult decision," he says. 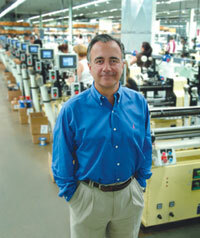 "We looked at the cost of relocating all the manufacturing and we felt we weren't ready to make that bold a move. All along we were working with the New York state economic development agency [Empire State Development]. They realized the significance of keeping us in New York and on Long Island." Suddenly an 87,000-sq.-ft. (8,082-sq.-m.) building formerly home to the Pergamon Paints company was found just around the corner in Melville, and Empire State Development supported the retention of 700 jobs and helped defray the cost of the move with a $1-million grant. Scottech kicked in with designing and warehouse and fulfillment system, including its Pickrow warehouse management software and a semi-automated conveyor system using four forward pick zones and a bulk area. 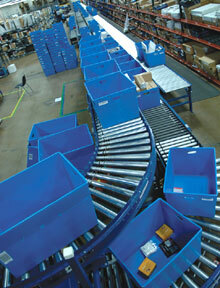 A new pick and pack system has helped D'Addario & Co. rapidly improve efficiency. 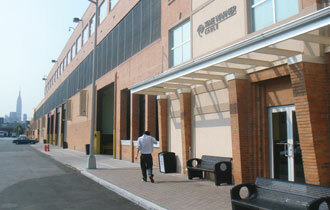 who also credits the Town of Babylon and the Suffolk County IDA with supporting the company's $9-million expansion. That support was there in 1994 too, when D'Addario & Co. moved into its current 110,000-sq.-ft. (10,219-sq.-m.) manufacturing facility with the help of an industrial revenue bond that allowed it to borrow $6 million at low interest and split the funds evenly among investments in equipment, the building and renovation. "The Town of Babylon has been sensational to work with over the past 25 years," he says. "Now that we're much larger, we can't qualify for an industrial revenue bond, because there's a $10-million cap. There are no real federal government programs that will help a business of our size, so the state came forward." That's not to say D'Addario wouldn't welcome a little federal attention to the plight of the U.S. manufacturer – especially one who strives to keep as much work as possible (87 percent) in the U.S.
"There is nothing to entice a manufacturer, or an owner of a business, to invest heavily in the business," he laments. "It's such a difficult thing to do. We've done it by sacrificing the income we can make in our business. We used to have an investment tax credit in the '60s and '70s. There should be some kind of job creation and retention credits from the federal government. And utility costs for manufacturing should be reconsidered – a federal program that helps manufacturing with the cost of energy so we can keep the jobs here." Half of what the firm makes in the U.S. is exported. But its Planet Waves product line of guitar straps and other accessories was offshored to Asia about three years ago, he says, where the company also carries out injection molding and production of plastic parts and tuners. "Otherwise we've been able to automate and control that here," he says. "Our strings, drumheads and reeds have no equal from the low-cost providers. We're not afraid of it, but we are constantly investing millions of dollars. We're now training 12 people to be lean – that's the only way we can continue to manufacture here." That, and a certain pride in craftsmanship. The company makes more than half of its machines itself, and such homemade intellectual property value is a hard thing to send abroad. 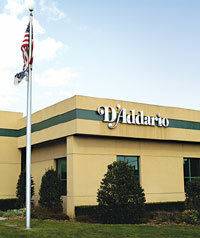 "We design and build it here," says D'Addario. "We have 11 engineers, myself included. Now I manage the project myself. There are about 10 people who do assembly and machining. 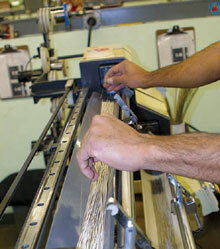 We have proprietary technologies that enable us to manufacture here in New York. For our automatic feeding systems, we're just finishing the second round of automated machines, for $1.4 million, and they're 50 percent more productive than our competitors' machines. That kind of vertical integration has been the key to our success." As is the fanaticism its products breed at the fingertips of the world's musicians. "Absolutely," agrees D'Addario. "We've created a great aura around our brand names, and people respect the quality. We just came back with six people who went to the Shanghai show. We're exporting our products to China." As evidenced by the Empire State Building in the distance, Time Warner Cable's new technician and equipment hub in Brooklyn is in a prime spot from which to serve the company's 1 million metro-area customers – and from a location less gentrified, more affordable and more accessible than its former digs in Manhattan's Chelsea neighborhood. Photo: G. Bardon, New York Grant Co.
Stagehands may have brought Broadway to a standstill in November, but Ann Kayman, CEO of New York Grant Co., says Brooklyn and Queens are setting the stage for logistics-driven industrial development. Exhibit "A" in this regard is the new logistics hub of TimeWarner Cable (TWC) on Newtown Creek in western Brooklyn, housing the company's tri-state-area cable operations and dispatch functions. "TWC has combined this new facility with a warehouse, centers for distribution, vehicle maintenance, equipment repair, customer service, tech support, training, union offices, and even an R&D center to experiment with new cable and digital phone technology," says Kayman. Opened in August 2007, the hub houses 523 employees. Kayman explains that the facility, formerly a Snapple warehouse and then "a woefully underused warehouse for a sign and trade display company," was purchased by Steel Equities and developed for TWC. "In just the past year, TWC and the developer have spent $6 million on build-out and another $3 million-plus on furniture and equipment," she says. "This does not count the purchase price. More investment is planned." The center is a busy hive of equipment and personnel, from which the "cable guys" are dispatched to serve TWC's approximately 1 million customers in the New York metro area. Kayman, TWC's lead incentives advisor, now is shepherding six applications for approximately $25 million in economic incentives, all from the city that used to employ her as an economic developer. They include benefits from the city's Relocation Employment Assistance Program (REAP), the Energy Cost Savings Program (electricity discount), ICIP (Industrial and Commercial Incentive Program). There is also a permanent exemption from commercial rent tax by moving from Manhattan to Brooklyn, and a real estate tax abatement whereby TWC as a tenant can get a five-year rent subsidy. "We hope, though discretionary, to get training grants from New York City," she says. Kayman says TWC's is but one example in an area rife with them, including FreshDirect's staging area to serve the city's 17,000 eating establishments, and Northrop Grumman's multiple facilities serving the rooftop antenna needs of the city's government vehicle monitoring program. Asked how the TWC site was chosen, Kayman says it's not too tough to narrow the field when it's narrow enough as it is. "There are very few sites in New York City that are able to accommodate needs like they have, so you don't need to look far," she says. "They were able to find it themselves a couple years ago. Steel Equities purchased the property from the sign display company. Steel Equities holds the title, and none of this was done with bond financing. It was self-financed. They developed it." Kayman says there are properties throughout the five boroughs "that are quasi-industrial and capable of being renovated to mixed use – office plus factory plus logistics hub. But it is a relatively precious stock, because when you're talking about 200,000 or more square feet of industrial space, with flexibility and with parking, and good access to transportation, you're really zeroing in on the prime industrial sites that remain. There has been a tremendous evolution of these sites over the years. The TWC site is an old airplane hangar built in the 1930s. And that's the beauty of it – a tremendous garage, multi-level, where there is a mezzanine surrounding the floor level where all of these cable vans and support vehicles can be parked in a secure environment. At the same time, it's surrounded by labs and offices, rooms for equipment, training, a call center, with parking, which is of course very scarce and precious." The TWC facility is on Newtown Creek, which separates Brooklyn from Queens just past the Midtown tunnel, and thus provides great access to Manhattan from just far enough away. "They had been for years in Chelsea, on West 23rd St. on the far West Side," says Kayman. "The site had wonderful offerings, but that whole area has been tremendously gentrified, and it no longer made economic sense for that operation to be in that facility." Not only had TWC operations outgrown their three-story building, but Chelsea's traffic has outgrown its capacity. The new Brooklyn space offers the firm four times the space it had in Manhattan, with room to grow. Asked whether there were state assistance for the project, Kayman says, "I've been speaking with the state about the company, and we can't find anything better on the state's menu, frankly, than what the city has. But we're still speaking with the state to see if there's something out there. The property is not in an Empire Zone, and that's a big distinction." The opportunity outweighs any other goodies that might be had, even if those goodies might be substantial and for many years," Kayman says. Kayman says the Empire Zone program "is really in a state of overhaul and oversight" right now, owing to findings in 2007 that some 3,000 of the program's 9,200 participants had not met the obligations required to retain the benefits. There are 82 Empire Zones now in the state, 11 of them in the Big Apple, with annual growth in number of 11 percent since their inception 20 years ago. "So the number of zones that has been designated has grown a lot in recent years, and there is still a need for more zones, especially in the area that TWC just went into," says Kayman. "I'm not saying this just for their sake. The area just below the Midtown tunnel is booming with new activity that's in the realm of what TWC is doing." Kayman says Gov. Eliot Spitzer's take on the situation, advised by Empire State Development's Downstate Chairman Patrick Foye, "is that this program needs a very careful look to see if it is indeed paying off for the state, or whether the state is giving up more than the program is benefiting anybody." How does a region attract venture capital? Check out Amy Zuckerman's new report on the VC environment in Albany, N.Y.
She says it has as much to do with loopholes as with fraud, but has high hopes the program will be straightened out rather than scrapped. Asked if she senses the overall tightening of credit affecting industrial firms and other expansion projects in the metro, Kayman says, "On the one hand, I detect a more wait-and-see attitude. On the other hand, real estate prices including commercial rents have gone up so much, there is a rush to lock in the best deal possible. Companies are trying to secure space the best they can. They want to lock in the best rate, and know what their numbers are going to look like in the next several years. "Midtown rents are higher than they've ever been, and that's putting pressure on the market throughout the five boroughs to absorb new business," she says, citing TWC as a prime example. "We have yet to see the whole fallout of this credit crunch. New York City residential and office rates are higher than they've been ever. Wall Street is awarding $38 billion of bonus moneys by the end of this year. So I guess, as we say here, 'Go figure.'" ust as Dutchmen like Adraien van der Donck helped shape New York's original colony by moving upriver from New Netherland to forge ties and seek out land, so too do companies continue to discover their own opportunities in the counties and towns abutting the Hudson and bearing the names of those forebears. The list below is a sampling of recent activity recorded in the region by the Conway Data New Plant Database, which tracks major non-lease corporate projects. Among the major leases in the area in 2007 was the move by Disney Publishing of some 175 jobs from Manhattan's Fifth Ave. to White Plains. In September, an environmental impact agreement was reached after a seven-year battle that will allow development to proceed on a $400-million new resort in the Catskills by Crossroads Ventures. As part of the deal, the resort, located in Shandaken and Middletown on the county line between Ulster and Delaware counties, will only disturb 273 acres (110 hectares), and the state will protect an additional 1,400 acres (567 hectares) now added to a state forest preserve. The project is expected to employ some 450 full-time workers and 150 part-timers, as well as some 1,800 construction workers during its projected eight-year building timeframe. The 2,400-acre (971-hectare) Stewart International Airport, whose story was chronicled in the January 2007 issue of Site Selection, officially came under the control of the Port Authority of New York on Nov. 1, 2007. The Port Authority Board of Commissioners in January 2007 authorized the purchase of the operating lease at Stewart for $78.5 million, and in September approved more than $17 million for parking and roadway improvements. The lease runs through 2099. "The expansion of Stewart International Airport will help to stimulate economic development in the Hudson Valley and beyond, and with our Smart Growth Initiative we will ensure responsible planning and environmentally sound growth," said Gov. Eliot Spitzer in announcing $500,000 in Smart Growth funding to help communities plan. Smart Growth funds are also involved in the resort project, as well as in the rejuvenation of Newburgh. "Additional air capacity at Stewart will also help ease congestion currently afflicting our increasingly stressed metropolitan airports as we near their capacity and plan for future population and passenger growth." 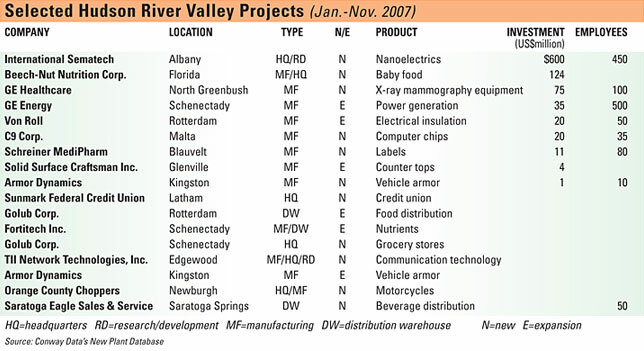 In September, Empire State Development announced it would be working with the area's Solar Energy Consortium to provide funds to attract solar energy-related companies to the Hudson Valley region, which contains nearly as many Empire Zones as New York City (10), more than 30 microelectronics firms, 90-plus biopharma firms and 30 colleges and universities. But the biggest energy-sector news came a month later, when GE Power Generation announced a 200,000-sq.-ft. (18,580-sq.-m.) renovation and the addition of 500 jobs in a $39-million project at Building 53 of its Schenectady complex, just north of Albany, where it has been in operation for 120 years. The incentive package includes $5 million from the state to reimburse the renovation costs; $825,000 in tax abatement from the city and county of Schenectady; and $2 million in sales tax exemptions on building materials, furniture and fixtures from the city. The company, in the midst of living up to its "Eco-Imagination" tagline internally, is also eligible to apply for up to $1.4 million from the New York State Energy Research Development Authority (NYSERDA) for energy-efficient equipment and construction. The company promises to complete the hiring of the 500 new employees by 2011, and will pay them an average salary of $75,000. Earlier in 2007, GE pledged to open a new Wind Product Management and Customer Support Center in its Schenectady-based Renewable Global Headquarters, producing 150 separate new jobs. Overall, the company employs 3,200 on its 640-acre (259-hectare) campus. "This is an excellent example of the global market driving local growth," said Steve Bolze, president of Power Generation for GE Energy. "We are seeing a dramatic, global increase for cleaner and more efficient ways of producing energy. By expanding our existing resources we are investing now to ensure we continue to deliver technology solutions that will meet our customers' growing requirements in the years ahead." The guys from the hit Discover Channel (now TLC) show "American Chopper" are aiming to be just as green as the next guy in their new headquarters in Newburgh. Expected to open in 2008, the 92,000-sq.-ft. (8,547-sq.-m.) Orange County Choppers complex, being built by Full Throttle Construction, will be 50 percent better than the building code for energy efficiency, according to Full Throttle project manager Henry Kroll. And SAIC, hired by Full Throttle to oversee the site's LEED certification process, says the new headquarters will see a 50-percent reduction in energy consumption over the company's former 33,600-sq.-ft. (3,121-sq.-m.) facility in nearby Montgomery. That property – now familiar to millions worldwide – was being marketed earlier in 2007 by Mansfield Commercial Real Estate.